For the best furniture, mattress, and appliance brands at the best prices, shop Kirk’s Furniture serving Circleville, OH. We make shopping easy! We offer home décor, furniture, appliances, mattresses and more for your living room, bedroom, dining room, home office, and other rooms! Just let us know what you want decorated and how, and our amazing team will help you make your home beautiful and comfortable for family and friends. 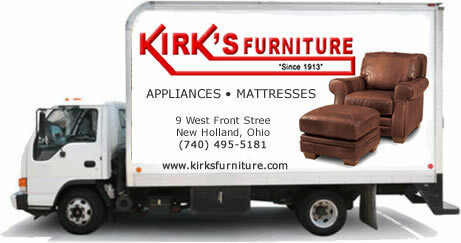 Kirk's will deliver your new furniture, appliances or mattress with great care on our trucks by our own professionals. We also make sure to do it during a day and time that is convenient to you. And we deliver locally for free! For over 100 years, Kirk's has been Central Ohio’s go-to place to purchase the nation’s leading brands of furniture, appliances, mattresses, and flooring. We have outstanding customer service and unbelievably low prices, so come shop today! If you aren’t sure about the pricing, we offer flexible financing plans customized just for you.